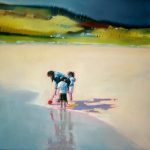 Sharon will be exhibiting at Art Source in the RDS, Dublin, which will be running from Friday 9th – Sunday 11th November. Here she will launch her Autumn/Winter collection of original oil on canvas paintings. If you wish to receive a free invitation to this event sent your full address to sharon@sharonmcdaid.com noting your request. Sharon will be exhibiting at Gifted (The contemporary craft and design fair) in the RDS, Dublin, which will be running from Friday 9th – Sunday 11th November.